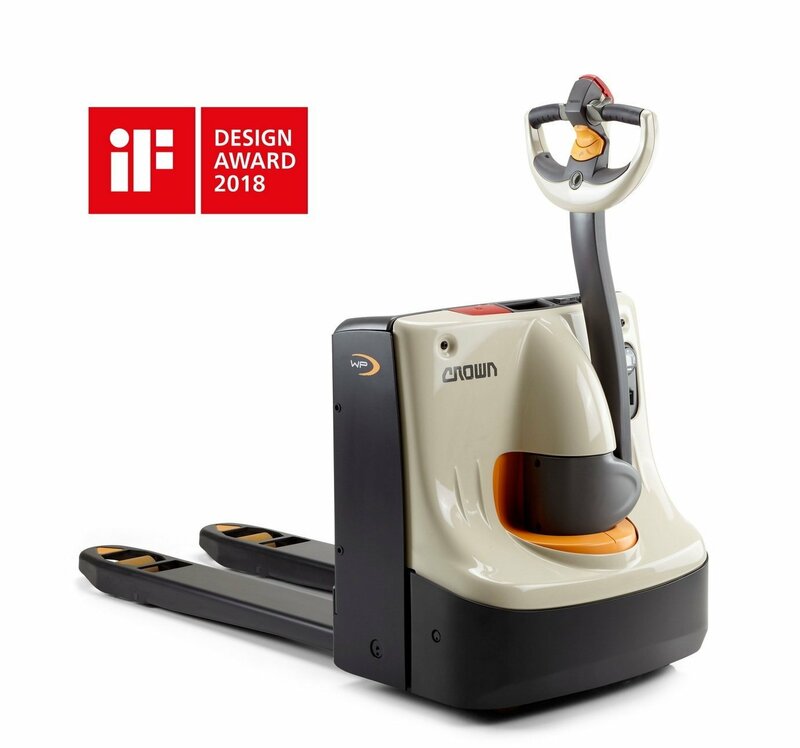 Munich, September 20, 2018 – Crown, one of the world’s largest material-handling companies, has received another International Design Excellence Award (IDEA), from the Industrial Designers Society of America (IDSA). A panel of experts awarded the coveted title in the “Commercial & Industrial Products” category, in recognition of Crown’s WP 3010 electric pallet truck. According to the jury, the pallet truck sets a new benchmark for product quality and user-friendly design, resulting in a best-in-class product. Over the decades, Crown lift trucks have received more than 100 awards from internationally renowned design institutions and associations including 23 IDEA awards. Earlier, in spring 2018, the WP 3010 also won the prestigious iF Design Award, presented by iF International Forum Design. Launched in 2017, the WP 3010 is an exceptionally compact, manoeuvrable addition to Crown’s WP 3000 pallet truck series. Weighing as little as 279 kilograms (without battery), the truck is exceptionally light. At the same time, it is also robust and powerful. With its short head length of 500 mm, the pallet truck is easy to manoeuvre in tight spaces. Thanks to durable steel covers, it will resist impacts and collisions throughout its working life. Despite a load capacity of up to 1.6 tonnes, the pallet truck is designed to fit neatly into a fully laden lorry without taking up valuable load space. Alternatively, it can be stowed and transported in a storage box underneath the vehicle. Founded in 1965, the non-profit Industrial Designers Society of America (IDSA) is one of the oldest and largest industrial design associations, representing thousands of expert members in the United States and internationally. Since 1980, the Society has presented the International Design Excellence Award (IDEA) in multiple categories every year. The event is one of the world’s most prestigious and rigorous design competitions. In 2018, a total of 1,800 competition entries in 20 categories were submitted from around the world; 145 of them were awarded an IDEA. The official award ceremony was held on September 19, 2018 at a gala event in New Orleans. Crown is one of the world’s largest material handling companies with a reputation for award-winning product design, advanced engineering and technology supported by superior after-sale service. Crown’s business philosophy utilises vertically integrated processes to design, manufacture and distribute forward-thinking, innovative solutions that improve customers’ productivity and operating efficiency. Crown develops, produces and sells a broad range of forklifts as well as automation and fleet management technologies. You can also visit our online newsroom at news.crown.com.